GPS digital producer Jason Miks recently sat down with Icelandic President Ólafur Ragnar Grímsson to talk about his decision to launch the Arctic Circle, the new great game in the Arctic, and why the region matters for U.S. national security. What’s behind the growing international interest in the Arctic? First of all, the Arctic is America’s backyard. Just by looking at a map you can see Alaska, the northern part of Canada, Greenland – the region is of crucial strategic, economic and political interest to the United States. In the Cold War, you didn’t have to explain to U.S. audiences why this backyard was important, because you had the so-called Soviet threat of missiles, submarines. So you had a vast network of military installations throughout the Arctic region. But with the end of the Cold War, the eight Arctic countries, including the U.S., succeeded in creating through the Arctic Council a venue for different organizations and institutions, a very constructive network to discuss how to evolve an area that during the Cold War was one of the most militarized areas into an area of constructive cooperation. This is important because the Arctic region as a whole is one of the world’s richest in terms of natural resources – minerals, rare metals, clean energy, gas, hydro. With the melting of the Arctic sea ice, it is opening up for at least three or four months of the year a new global sea route which, to some extent, will replace the Suez Canal as a formidable linkage between Asia on the one hand and the U.S. and Europe on the other. If this isn’t enough for America to be interested, the wake-up call should be that this neighborhood is now becoming crowded, because countries like China, Japan, India, South Korea, Germany, France, the United Kingdom have all in one way or another entered the Arctic and declared their intention of becoming involved in this new economic, political and scientific playing field. Secretary of State John Kerry was wise enough along with the other foreign secretaries of the permanent Arctic Council members to accept this reality, and therefore agreed a few months ago to allow a number of Asian and European countries to enter the Arctic Dialogue in a formal way as observer states. This means that the U.S. now does not just have to deal with China, Japan, Germany and others in the G8 or G20, but it also has to deal with them in the Arctic. In two years’ time, the U.S. will take on the presidency of the Arctic Council which is different from many other international organizations in the sense that the presidency is not just a formality – it is supposed to give a policy direction. So all the Arctic countries, European and Asian observer states will be waiting to see what priorities and guidance the United States will bring to the presidency. How does the Arctic Circle that you helped create fit into all this? There are three or four reasons why I think the Arctic Circle is a necessary addition to this dialogue, and why many of us who have been active in Arctic cooperation for over a decade decided to take this initiative. The first reason is that up to now, most Arctic conferences had been rather small and specialized. But the issues they talked about are all interrelated in important ways. There is therefore a need to create a forum where all the different constituencies, whether they were policy constituencies, experts or business constituencies, are able to come together and listen and educate themselves. Because this is a new territory. We all need to be educated on this. The corporations – whether they are shipping companies, mining companies etc. – which want to be active in the Arctic need to be aware of the complicated issues. So we need a forum where once a year, like in Davos, for example, all these players come together and are able to listen to each other and therefore broaden their basis of decision making. Secondly, if the Arctic future is going to be successful, it has to be more science driven and knowledge driven than many other international issues. Therefore there was a special need to bring a formidable body of scientists and other experts into dialogue with policy makers and business leaders and others. Thirdly, although the Arctic Council has accepted these states from Asia and Europe, it is still early days. So there is a need for a forum where all of us can ask questions like “Why is China interested in the Arctic?” “What is the agenda of India?” “Why is South Korea so active there?” And now we have the paradoxical situation that China and India have been accepted to observer status and are now more cooperative in my part of the world than they are over the ice in their own part of the world – the Himalayas. We needed a more open and frank dialogue. The Arctic Circle hopes to be such an open and democratic forum where an activist, a journalist, anyone can be part of the debate. What is fascinating about the Arctic tradition, so to speak, that has been given to us by the indigenous people, is this democratic village sprit where everybody has a say, and everybody has a right to speak up, irrespective of their position. The Arctic Circle is a tool for allowing the region to be transformed into this new important playing field, to help these different players that are now coming to the Arctic to present their case. Especially now, when all of this is happening very fast. There is a need to have this open, flexible and wide ranging forum that meets every year at the same time so people can plan their participation. I think that the way this has come together in the past few months proves that our analysis was correct. This is a forum that was needed. Are you worried that countries like the United States, China, South Korea see opportunities, but will fail to see the responsibilities that come with greater involvement in the area? That worry has always to be there, because the economic benefits are so strong. The Arctic is so rich in resources, and the opening up of the sea route creates such a fundamental change in global trade and shipping. There is always the risk that these overwhelming economic interests at play in the global economy will dominate. In Denmark, you have discussion on who can decide on uranium exports from Greenland. Is it the Greenland Inatsisartut or does the Danish government also have to be involved? If you had said five years ago that the question of uranium exports from Greenland would become a hot political potato, none of us would have believed it. I remember I attended a conference in Alaska eight years ago, and there was a young Russian scholar who had just finished a master’s thesis on this new northern sea route. Most people thought he was a nerd – they wondered why someone would spend their academic career studying something that might happen in 2040 or 2050. But it is already happening. So, the pace of the economic change in this territory has reminded all of us that we have to be on our toes. The good news, however, is the spirit of cooperation in the Arctic Council. There, Russia has played a very important role. That should be acknowledged, including the role of President Putin. It may sound surprising for many people in America who look at Russia from a certain perspective. But people have to remember how important the North, the cold North, is to the history of the Russian people and Russian politics. The Russians don’t need any lessons on how tough this environment is. The same with us in Iceland. The same with the people in Alaska. So, hopefully we can educate the new players who are coming into the Arctic. Yes, we welcome you, and we recognize you have legitimate interests in being there. But you should also respect this knowledge driven, science driven policy making process. I have to tell you, I am more optimistic now than I was a few years ago. Take South Korea. South Korea has built up a formidable polar institute that might surprise a lot of people. 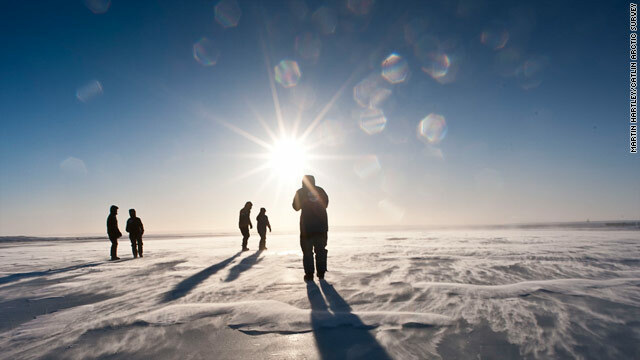 Similarly, in China – the Polar Research Institute of China is a remarkable organization. They have researched the melting of the Arctic sea ice, and how that leads to extreme weather events in their own country. They have a lot to contribute to the science of the Arctic. America has only one ice breaker. So with all due respect to this great country, you don’t have the infrastructure or even the scientific manpower to gather the necessary, comprehensive knowledge on the Arctic. You, like us, need partners. We need comprehensive international cooperation to make sure that the economic future of the Arctic, the political negotiations, will be based on sound science. I’ve always been very honest with my friends in America. I’ve been coming to Capitol Hill to talk with senators and members of the House for almost 30 years. And in April, after we launched the Arctic Circle, I had meetings with more than 15 senators, including the majority and minority leaders. I’ve been in Washington before, to talk about the Arctic. Five years ago, it was still the case that the prevailing view in Washington was that the Arctic was only about Alaska. But it is much more complicated than that. America’s interests are much more wide ranging than that. If America wants to be a major player in the 21st century economy, it has to look at the issue in a very comprehensive way, like China, like Japan, like India. I saw some signs this year, for the first time, that the United States is recognizing that the Arctic has to move up on the policy agenda in Washington. It’s not a peripheral issue – it is a core issue to the long term American future – from an economic point of view, but also a strategic one. Like you didn’t have to explain to Washington in the Cold War that the Arctic was important, I hope that we can reach a shift in the near future where Washington will similarly acknowledge that this is so now. Hillary Clinton was perfectly aware of this – she didn’t need any lessons. But she had a tough battle within the State Department, within the policy making framework, to move this up the policy agenda. She was the first Secretary of State to come to a meeting of the Arctic Council, whereas the Russian Foreign Minister had been there every time. And Kerry followed her example. When I need to point out to America why the Arctic is important, and they don’t accept all the arguments I’ve made, I put homeland security on the table. Why do I do that? As everybody in this country knows, homeland security has understandably been an extremely important issue for the United States in the past decade. But the entire structure of your homeland security, all the money and the manpower that you have put into this system, has been based on the assumption that the ice is not melting. And it has been considered so obvious it wasn’t even stated. But now the ice is melting. Now the Alaska coastline, which is longer than from Maine to Florida, is ice free for a considerable period in the summer. So anyone on a boat could potentially enter your country without being checked, because there is no real homeland security infrastructure up there. You can send boats up to the Alaskan coast in the summer if you want to smuggle things, let seaplanes pick up the goods, drugs or whatever, and since the flight is an internal U.S. flight, you can bring it in much more easily. When I bring in this issue of homeland security, people pay attention. And it’s true – you only have to look at the length of the Alaskan coastline to see what an enormous challenge this is for the U.S. This also means, for example, in terms of search and rescue that you need the involvement of others. As I said, this has for centuries been your backyard. And now it is becoming crowded with people who have never been there before. They are different players. They are guests with different interests. How does Iceland feel about these new guests? We actually welcome this transformation, because it gives Iceland a strategic position that we didn’t have before. It has also given our scientific community many interesting challenges, brought us into a dialogue with countries like India, Singapore, and others. Now in meetings I’ve had with Asian and Russian leaders, they all talk about the Arctic. That is a big shift. Looks like a cut and paste job. Hegemonism of any sort should be resisted, and that's what the US at's it taxpayer's expense has been doing since 1917. I am not sure why Mr. "ZacK' continues to sponser or write articles that deplore Americanism. Whether we are doing too much or not enough it's usually always the wrong thing. He is bright enough but resistant to explore the historic geopolitical antecedents of conflict that don't extend beyond the near and middle east. This piece still has me wondering what the crisis is all about. We have submarines sitting on the Arctic floor. That should be enough for now. You along with Iceland's President Grimsson seemed to have forgotten Mr. Miks, that the Arctic is also Russia's back yard. The Russians have every bit as much right to be in the Arctic as we and the Canadians do. In other words, no one nation should ever claim the Arctic as it's colony. If you'll read the interview one more time, you'll notice than neither Mr. Miks, nor President Grimsson suggest such a thing. Business is more important than environment. People are either ignorant of the dangers to the environs or are shameless. Arctic is not a place to do business. Nature will not spare humanity, if they keep destroying the balance of nature. Look I'm happy for Iceland and respect their views, but the majoity of the artic circle to which you refer actually is Canadian and that will not be changing anytime. In the last meeting in May in the northernmost town of Kiruna, Sweden, the Arctic Council considered to view new applications. However such a decision requires consensus. Canada and Russia are opposed, while the Nordic countries are in favour. Norway's foreign minister believed the opening for more observers in the Arctic Council would prevent them from forming their own club. Countries such as Canada that oppose inviting in more observers fear the voice of indigenous people who live in the Arctic will be diminished. The White House had unveiled a new Arctic strategy with three policy aims: advancing national security interests, responsibly managing the Arctic ecosystem, and bolstering international relationships. I concede with the opinion that some business sharks forget about the environmental issues of the Arctic polcies. Governments should really care more about wildlife than about oil. We are standing on the verge of a new era, because global climate changes and soon our planet will look differently. Northern countries must listen to each other, and governments should listen carefully to non-governmental environmental organizations from other countries. Cognition comes through comparison! For example, Canadians should consider what WWF-activists do, Russians – what Greenpeace has to say and Iceland – some Danish organizations, but the idea is to be thoughtful about what independent environs bear in mind.